DataSpace achieve excellence at Royal Lytham! Home/Blog/DataSpace achieve excellence at Royal Lytham! DataSpace are pleased to announce a personal achievement attained by our Business Manager Andrew Butcher! Andy managed to hit a hole-in-one at the infamous Royal Lytham and St Annes Golf Course. The round of golf was part of a Shirley Crouch Event which is a company who has hosted many Business Network events. Andy attended the event with Frank Butcher, his father and the Operations Director at DataSpace. Shirley Crouch events are great opportunities to develop business contacts and to socialise with business acquaintances. Andy told me; ‘The thing I enjoy the most about these events is playing top courses, whilst meeting new people. There is also a competitive element to these events but enjoyable at the same time.’ DataSpace is a company built upon rising to challenges, producing outstanding results and supporting our clients as well as our employees. Here with the support from Frank and his own determination, Andy managed to surpass his own expectations and land a hole-in-one which professional golfers would struggle to accomplish. Royal Lytham and St Annes Golf Course is a highly regarded Championship course and has been home to the Open Championship four times, most recently the Open was held at Royal Lytham in 2012. Andy has played golf for the many years; however this was only his second time playing at Royal Lytham! 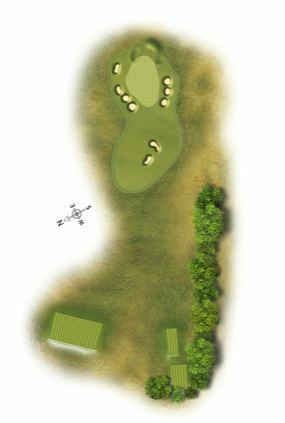 The hole-in-one was managed on the very first hole which the Golf Club describe as ‘No gentle introduction to the course, but ample warning of the demands that lie ahead. The trees to the right of the tee protect you from the prevailing wind making club selection difficult to a green protected by severe bunkers.’ Andy used a 6 iron and was sure to tell me the hole was 175 yards long. Which to a novice like me not knowing about golf, a hole that large would surely be exceptionally easy to hit in one shot?! Andy was ecstatic as not only was his hole-in-one on the very first hole on the course, or the fact it was on the course the Open Championship was hosted at only last year BUT this is his first ever hole-in-one! DataSpace work on the belief that with hard work, planning and organisation anything is possible. This is why we are sure that with Andy’s ambition and skill this will not be his last hole-in-one. N.B I have now been assured that the 175 yards is the length from the tee to the hole!